Is it the love bug, or bug love? The average guy would probably remember to bring something back for his loved one after a long trip -- jewelry, candy or a postcard -- but not Josh Der. He knows the way to his wife's heart: an orchid bee. "He brought me back the bee from Costa Rica," smiles Kristal Watrous, Der's wife. The bee is shiny green and about three-fourths of an inch long with a tongue to match (about an inch long). 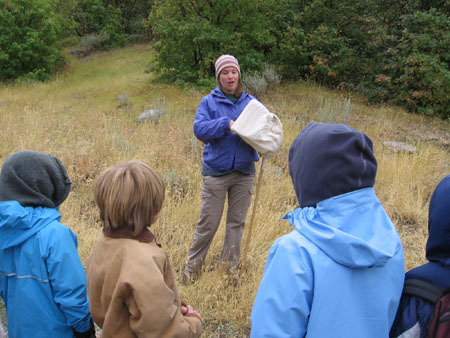 If you have an interest for insects, consider joining the Entomology Club at USU. The group will be watching fun flicks on the creepy crawlers throughout the year, and also sponsoring collecting trips and activities throughout the community. For more information, contact Kristal Watrous, the president, at kwatrous@biology.usu.edu or (435) 760-4908. Der didn't develop a love of bugs until he was working on his bachelor's degree in botany. He met Watrous, a friendly, outdoorsy girl from Washington, in an unlikely place: collecting and curating insects in an entomology class at Humboldt State University in northern California. Four years later, they continue to share a passion for the little critters. "We fell in love during the class, collecting bugs and going on fieldtrips," said Der, a USU doctoral student in plant genetics and evolution. "I'm interested in insects as a hobby, and Kristal's an entomologist for her school." Some would say the pair caught the love bug, or just a love of bugs. Whatever the case they have collected insects throughout the Midwest, southern Utah and on their separate travels to Belize and Costa Rica for research. "We look at bugs wherever we go," said Der. "Depending on the type of habitat we're in, we'll look for different or interesting insects. Often big ones are kind of fun to find, or pretty ones. Shiny, neat patterns or ones we haven't seen before are also fun to look for." The couple has more than 5,000 insects in their collection at home of mostly bees, butterflies and other rare finds. Watrous is a USU graduate student studying pollination biology. They also have a display of artwork featuring insects and plants on the walls above their five storage cases to greet visitors. "Most people are surprised to find there are about 20,000 different kinds of bees," said Watrous. "I thought they were neat, cute and fuzzy. I guess you could say I got hooked." Der believes his wife's love of bees complements his passion for plants perfectly. "Since bees are important pollinators, you look for bees on plants, particularly on flowers," says Der. "We often spend a lot of time looking at flowers, which is something I like to do." When Watrous began collecting bugs, at the age of 3, she was scared of the "ones that sting" but still managed to help her mother with a school project, and find the love of insects that has helped guide her education. "My mom was in an entomology class, and I was excited to get to help her collect insects from the one tree in our yard," said Watrous. "She ended up with more lady bugs and related beetles than anyone in her class She actually used the different species of lady bugs to trade for some of the bigger, more difficult to find insects with her classmates. I contributed significantly to her collection and helped her out!" The couple's families are both supportive of the hobby they share, although when they were first dating, Watrous received a little bit of teasing from her now in-laws. "I brought Kristal home for Christmas when we were early on in our relationship," said Der. "Her stocking was full of candy bugs and buggy things." Watrous said that now their family appreciates their knowledge and will often call the couple with questions about insects they spot. The couple hopes this interest will also spread to their future posterity. "We're going to have really nerdy kids who like collecting insects and plants," said Watrous, who is expecting their first child. One thing's for sure: the baby on the way will not have an insect name. "Maybe a plant name," said Watrous. "We've thrown around a few really geeky names, but haven't decided on anything."